The Trifolglio Bowl is just one of many dishware items from Italian designers Robex. It has its roots firmly in the mid-century modern movement, with its innovative use of moulded plastics. The Trifologio Bowl uses five layers of polystyrene to create a durable product that looks stunning too. 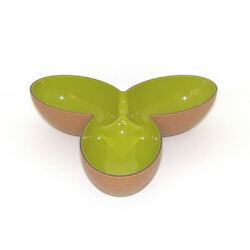 The design of this particular bowl with its three sections makes it ideal for serving nibbles, chips and dips. It is available in a choice of decidedly Seventies colours, wood effect exterior with lime inside or orange exterior with lime interior. They cost just under £12 from Optima Style. There are various other shaped bowls in the range as well.